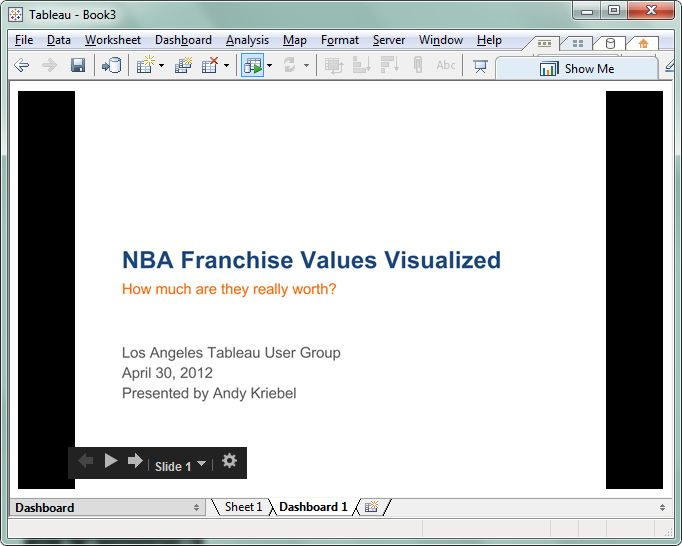 Monday night I had the honor of running a training session for the LA Tableau User Group. You can download the presentation and Tableau workbook here. One of the features of Tableau that I showed them was a PowerPoint presentation embedded in a Tableau dashboard. I use this technique quite often as it allows me to stay in one tool, thereby negating the need to flip back and forth to PowerPoint. In this blog post, I will review the steps to use this functionality. 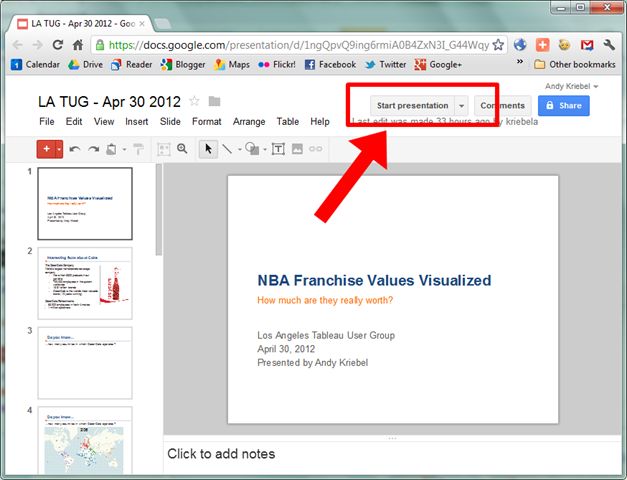 This example assumes you are using Google Docs to host your presentation. This technique also works with presentations hosted on SharePoint. Any other web-based presentation solution should work as well. Step 6 – Once you drop the Web Page object onto the dashboard, the Edit URL window appears. Paste the URL for your presentation (from Step 4) and click OK.
That’s it! Your presentation is now embedded within a Tableau dashboard. If you don’t like the black space to either size of the presentation, the optimal size for the window (assuming you’re using a presentation from Google Docs) is 792 x 600. Give it a shot. I bet you’ll use this over and over again. When you place Tableau dashboard consisting presentation on the blog is it "heavy"? Does it take a lot of time to open the website with the dashboard? or maybe just like normal dashboard? I have not seen any performance issues. 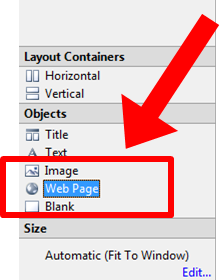 Tableau is simply displaying a web page. However, when I publish to Tableau Public, the presentation will not show. I haven't researched why yet. This trick really made the entire session seamless and facilitated the flow. Much appreciated Andy, and very cool that your method of delivering the training was itself a key learning! My pleasure Ben! I had a lot of fun. As a community of users, I think we should do more of our own training sessions on the web. Thnx for sharing. Is there a way to publish dashboards in power point presentations as well? Business Objects guys are highlighting this functionality about their products nowadays. Yes, you can definitely embed a Tableau viz inside of PPT. I'll write another blog post with the instructions. And don't believe anything the BO folks are telling you. They sell vaporware and that's it. Very little of what BO is does anything out of the box. Of course, you're more than welcome to spend millions customizing it, but you'll never get anything like the power of Tableau. I'm looking forward to your new post, cause it's a very executive attractive functionality! 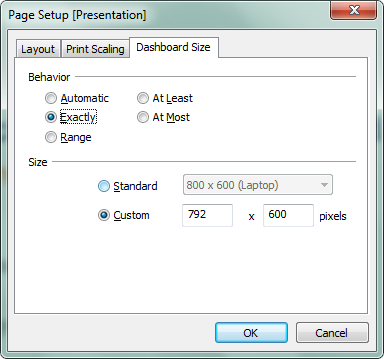 Andy, the capability to have Tableau inside PowerPoint would be huge ! Do you plan to publish that trick any time soon ? I've posted the instructions for embedding Tableau in PPT. Hi Andy, i have trouble displaying a pdf file in a dashboard. i use a dashboard Action and set the URL to go to when a sheet is selected. It works fine in development, but get a error when published, "A potentially unsafe URL has been blocked". Yet the same URL works fine when pasted into Internet Explorer. both the tableau server url and file located are trusted sites. Have you any idea why this is ?